A heavy-handed potboiler, but as it raises the temperature, it does give cause to consider the line—so easily crossed—between social function and disasterous personal undoing. 115 min. Warner Bros. Pictures International. Director: Joel Schumacher. Cast: Michael Douglas, Robert Duvall, Barbara Hershey, Rachel Ticotin, Tuesday Weld. In 1995, ex-military man Shawn Nelson broke into a National Guard armory, stole an M60 tank and laid waste to suburban Clairemont, California before being fatally shot. Though the cases don't come much more extreme than this one, the image of white males walking into office parks, fast-food restaurants, and schools armed with assault weaponry, inititating mass murder and precipitating "suicide by cop" has sadly become an increasingly familiar one by the turn of the 21st century. What possesses a man to do such a thing? The answer lies largely in madness (and in Nelson's case, methamphetamine), but partly in a society lacking in safety nets for disaffected males. Men raised to believe in male utility as warriors and providers, American brotherhood, and institutional loyalty from the government, corporations, and spouses found themselves at sea when they learned first-hand that—as the Cold War lay to rest—neighborhood crime, forced retirement, "downsizing" and divorce were the new norms. This phenomenon of blindsided men serves as the focus of Falling Down, Joel Schumacher's 1993 melodrama of a man at the end of his rope. Actor-screenwriter Ebbe Roe Smith set the film in L.A., what Susan Faludi called (in her non-fiction tome Stiffed) "Ground Zero" of the modern masculinity crisis. There, downsized Department of Defense employee Bill Foster sits in dead-stop gridlock on a sweltering, smoggy morning. He really wasn't going anywhere anyway, literally or figuratively. Stuck living with his mother (Lois Smith), Bill has only been pretending to go to work. To add insult to injury, it's his young daughter's birthday, but his ex-wife (Barbara Hershey) has a restraining order. As we all know, heat sets "the mad blood stirring," and in a sequence inspired by 8 1/2, Bill snaps and abandons his vehicle, telling the assembled commuters and construction workers, "I'm going home." "D-FENS," as he's quickly dubbed by virtue of his personalized license plate, turns out to be a middle-class mass of frustrations borne of perceived social slippage from good old days that never existed. He's as racist as he is patriotic, a fact made clear when he repeatedly insults a Korean-American corner market owner (Michael Paul Chan) who refuses to cut Bill a break on making change for a phone call. With the owner's baseball bat, D-FENS lays waste to the store and demands his own reality, yelling, ""I'm rolling back prices to 1965!" 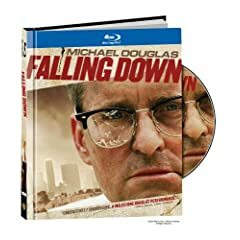 As Bill walks across L.A., Falling Down becomes an urban-jungle picaresque, with D-FENS escalating in weaponry (from the baseball bat to a butterfly knife to an Uzi) and no-turning-back insanity. Lest he let the audience off too easily, Smith pens an extended sequence that's designed to make Bill's frustrations relatable and his out-of-control actions wish-fulfillment that implicates the audience: "Whammyburger" fast-food employs deny Bill his breakfast request by a matter of minutes, but they don't know with whom they're dealing. It's D-FENS who's finally in over his head when he gets out-crazied by a chummy neo-Nazi (Frederic Forrest) who insists, "We're the same." There's no getting around that Falling Down is a heavy-handed potboiler, but as it raises the temperature, it does give cause to consider the line—so easily crossed—between social function and disasterous personal undoing. Throughout the film, Detective Martin Prendergast (Robert Duvall) serves as a counterpoint: an ultra-competent cop also being shown the door. "Whipped" into submission by his high-maintenance, obsessive wife (Tuesday Weld), Prendergast sees the writing on the wall for the rest of his life, and he prolongs his last day on the job while nearly everyone around him tries to get him to just call it a day. It's no wonder he carries on a sort of sexless emotional romance with a fellow detective (Rachel Ticotin) who understands and respects him better than anyone else alive. He's also uniquely suited (surprise, surprise) to chase down and talk down D-FENS, if indeed that's even possible. Schumacher keeps it all simmering with an oppressively hot and muggy look and by keeping his cast on an even keel. In his bad crew cut, Douglas makes D-FENS a credible and pitiable character. D-FENS: I'm the bad guy? D-FENS: How'd that happen? I did everything they told me to. By then, Bill's horn-rimmed glasses have sprouted a cracked lens, a symbol of his compromised vision. He laments, "I'm overeducated, underskilled. Maybe it's the other way around. I forget. And I'm obsolete. I'm not economically viable." Duvall's crafty-coot character has rarely been more likeable or more invaluable. After all, it's hardly typical Hollywood fare to make the protagonist—unmistakeably D-FENS—deeply disturbed. Falling Down still carries the frisson of an aberrant studio picture, one that shouldn't exist and most likely wouldn't be made today. In an unwelcome vindication of the film's vision of Los Angeles as a cauldron of resentment, frustration, and seemingly irreconcilable cultural conflict, the Rodney King riots erupted during the film's shoot. Warner demonstrates the esteem in which they hold Falling Down by making its next-gen release a Digibook title that packages the Blu-ray disc with a 38-page full-color booklet. The booklet includes an introduction to the film culled from the production notes, cast bios and filmographies, "critical consensus," and an essay on the film's "examination of the 'bad guy.'" The new transfer is a bit of a disappointment, but it seems likely that this is a film that defies a digital rendering. Schumacher clearly intended the film to look hazy, and indeed it tends to look blurry on home screens. Crucially, the color is fantastic, and detail and black level, and contrast are certainly sturdy and a noticeable upgrade from DVD. The lossless audio comes in a Dolby TrueHD 2.0 Surround track, which is not surprisingly front-heavy but gets the job done as well as a 2.0 track can. Hmm...maybe the book packaging is meant to offset the potential letdown to home-theater junkies. But there's another very good reason to double-dip on this title, which has never yet had a special edition. The Blu-ray (as well as the new Deluxe Edition DVD) includes two new bonus features. The first is a commentary by Michael Douglas and director Joel Schumacher, with screenwriter Ebbe Roe Smith, editor Paul Hirsch, Michael Paul Chan, Vondie Curtis-Hall, Frederick Forrest and Los Angeles Times writer Shawn Hubler. It's a well-done stitch job that isn't really screen-specific but that gathers plenty of interesting perspectives on the film, its development and making, and the social themes. 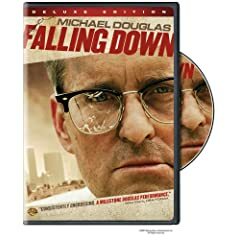 "Deconstructing D-FENS: A Conversation with Michael Douglas" (10:11, SD) is an excellent 2009 interview in which Douglas looks back on one of his most challenging characters and recounts stories about taking the role and his experiences making the film. All site content © 2000-2019 Peter Canavese. Page generated at 04/19/2019 02:11:56AM.